When the Chickens Went on Strike by Erica Silverman is stunning — which really counts for a lot for me because I think that everyone judges a book by its cover. Even more so with children’s books: everyone judges a picture book by its illustrations. But I will offer, that it is on a bit of an odd topic. Adapted from a Sholom Aleichem story, Chickensis about a boy who has a really hard time being good. He wants to be good, he really does. But somehow between wanting and doing is a big leap — the same problem that many children I know have. So, what’s odd about that? Well, then comes the custom of kapores — the ritual that few non-Ultra Orthodox Jews do anymore — where a person swings a chicken over their head as a way of atoning for their sins. It’s an odd custom and the chickens don’t want to have any part of it (naturally). In the process of trying to convince them, this boy (and the reader) learn a good lesson about how to be a better person (I’ll give you a hint, it’s not related to whether or not you swing a chicken over your head). This week is going to be all Rosh Hashanah all the time, for fairly obvious reasons. One of my favorite Rosh Hashanah books is Even Higher by Richard Ungar. I have to admit, the illustrations do not thrill me. It’s a question of taste — it’s not that they are bad, I’m just not into the Chagall colors. But the story is lovely. Based on a story by the great I.L. Peretz, It’s about a couple of boys who see the rabbi disappear the day before Rosh Hashanah every year. This year, they’ve decided that one of the boys should follow him to prove that he goes up to heaven to talk with God. When Reuven sees him disguise himself as a woodcutter and bring wood for a bedridden widow, he realizes that one’s actions can actually bring you “even higher” than heaven. Even Higheris a wonderful story for Rosh Hashanah about the power of human actions and can be a fantastic conversation starter about the value of Tzedakah (charity). Rarely do we get such a wonderful portrait of charity being given without hope of recognition. There are some folktales that are centered around the need for a heroine to ignore ugly old people who want to stop them from marrying their dashing prince. They are tiresome and should be replaced at all costs by The Paper Bag Princess by Robert Munch. And then there are folktales that can actually offer good teachable moments. Sadly, they are often ugly, printed on cheap paper, with poor illustrations and lots of words on every page. The kind of book you only want to read if your child already has his/ her eyes closed. 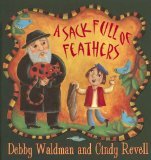 And then there is A Sack Full of Feathers by Debby Waldman. While it takes place in an Eastern Europe shtetl, it has more colors than you can shake a stick at and is not parochially Jewish. What it is, is a great story that addresses children where they are at. Yankel is a storyteller — a child with a gift for telling stories and capturing his listeners attention. The problem is, his stories aren’t his own: they are stories he overhears and thinks he is repeating properly, with no concept of discretion or the subtleties around the truth. Basically, he is like many of my carpool kids, and my 5-year old, who repeat things not maliciously but because they don’t really know better. Enter the rabbi who wants to teach this boy a gentle lesson with a practical lesson on what happens to feathers (stories) when you let them loose. It’s funny, it’s beautiful, it’s magical and it’s great for kids lacking discretion (and their parents too).